KIEV, Ukraine -- Throughout the Cold War, the symbolic center of the standoff between the Soviets and the West was Germany, split in two — much as the whole of Europe was — by the infamous Iron Curtain. 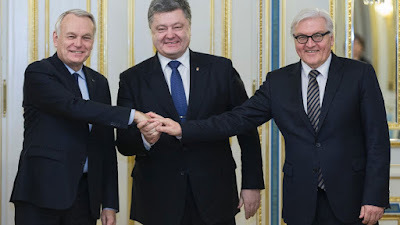 Ukrainian President Petro Poroshenko, centre, German Foreign Minister Frank-Walter Steinmeier, right, and French Minister of Foreign Affairs and International Development Jean-Marc Ayrault, pose for a photo ahead of their meeting in Kiev, Ukraine, Monday, Feb. 22, 2016. Germany and France are pushing for Ukraine to move ahead with reforms needed in order to implement the year-old Minsk peace agreement. But now, in Ukraine, a new center has emerged in the rivalry between East and West, dividing the country in ways that could prove just as enduring as the decadeslong partition of Germany. This week marks the second anniversary of the Euromaidan uprising that drove former Ukrainian President Viktor Yanukovich from power, shaking Ukraine to its foundations and driving Russia-West relations to their lowest point since the end of the Cold War. Much has changed in the two years since: A pro-West government formed in Kiev, Russia annexed Crimea, and a rebellion in eastern Ukraine developed into a full-fledged war. Meanwhile, the United States and the European Union have levied sanctions against Russia. Moscow has responded with countersanctions against the West. Economic activity between Ukraine and Russia has ground to a halt. As the Ukrainian conflict enters its third year, a flurry of negotiations aimed at ending hostilities is taking place. At higher levels, officials are holding talks in Normandy to address the conflict’s political aspects, while on the tactical front, there are discussions in Minsk to sort out the details of a cease-fire. Alongside both, countless bilateral meetings are being held. Occasionally, these talks renew hope that a lasting agreement can be reached. In reality, though, Ukraine’s crisis is not a short-lived skirmish that a little additional negotiation can resolve. Rather, it is a deep-seated conflict, rooted in geopolitics, that stretches back centuries and will likely continue to exist in some form for many more years. Understanding Ukraine’s role in the Russia-West rivalry, with its similarities to Germany’s role during the Cold War, is crucial to envisioning how Europe’s future may evolve. Ukraine has long been a polarized country. Strategically located on the open plains of Eastern Europe, the country can trace its divisions to the numerous powers and empires that sought to claim shares of its territory. Ukraine first belonged to Kievan Rus, a medieval Eastern Slavic state centered on Kiev that encompassed modern-day Russia, Belarus and Ukraine. But the kingdom began to decline, eventually falling to the Mongols in the 13th century, and the center of Eastern Slavic power shifted to Moscow. Kiev, and the territory that today makes up Ukraine, languished. Still, Ukraine was not left to its own devices for long. To the east and west, respectively, Tsarist Russia and the Polish-Lithuanian Commonwealth each controlled parts of Ukrainian territory and jockeyed to gain more. Over time, the Russian Empire chipped away at the commonwealth’s hold over Ukraine, until the Polish Partitions eliminated that state altogether. The Russian Empire subsequently divided Ukraine with the Austro-Hungarian Empire to the west until both fell during World War I. After a brief period of independence, Ukraine was divvied up once again, this time between the Soviet Union and the newly independent Poland. Nazi Germany occupied Ukraine during World War II, after which Ukraine was reincorporated into the Soviet Union until the bloc collapsed in 1991.